Today, people especially business executives rarely have time to go through the long textual content. They are busy bees looking for different ways to consume content. Even the storytelling medium is changing, and so is the popularity of podcasts among businesses. With increasing investments pouring in, marketers are keen to make use of podcasts to drive more traffic to their brand. A podcast is an audio file available in digital format. Listeners can download it and listen at their convenience. It is the freedom from broadcast and time constraints that make podcasts an ideal resource. Based on its growing usage, it is quite evident that podcasts are here to stay. Lately, podcasts gained momentum and have been able to mark its presence in the digital arena. The sole purpose of a podcast is to engage with customers. And in the process offer them quality content in an audible format that they can listen even during their work. It becomes significant for a marketer leveraging podcast as part of a promotional strategy to understand the mindset of the customer. Hence, one needs to find out what style, tone and subject matter audience would like to have in the podcast. Marketers can categorize their podcast into various segments based on their area of discussions such as technology, healthcare, business, and more. Try to find out what type of audio audience wants to listen so that accordingly you can structure your podcast around it. A podcast is all about audio content. Unlike visual or readable content, there is nothing that you can see in a podcast and hence it is the audio that matters here. 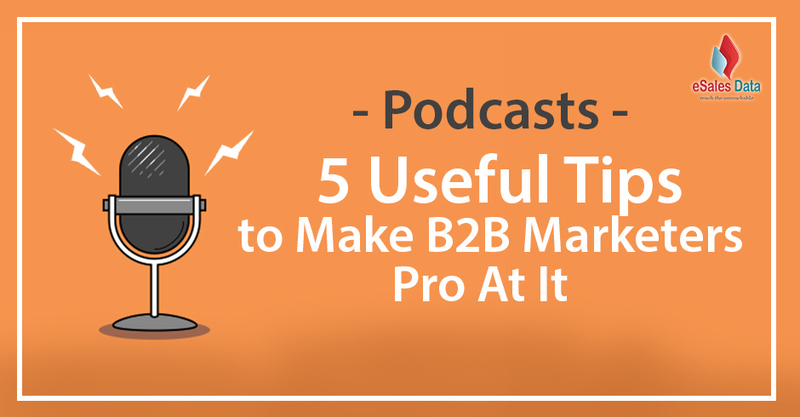 If you use a podcast as part of your marketing strategy, you need to assure that the quality of the sound is top-notch before making it available to the audience. Not only while recording, even while editing the podcast remember that you make changes in a way that it eliminates any loose ends if it exists. The audio should be clean and professional so that your brand stands out in the crowd and listeners prefer your podcast over the others. Having a catchy name for your podcast is a must. Even if your podcast features an interview, the title should be an attention grabber. Also, if you podcast an existing textual content like a blog, make sure that the title is engaging. It should reflect the flavor of the audio content. Determining the name of the podcast that will translate into valuable responses from the customer is very important. Hence, one should brainstorm in finding the right title that will suit a specific podcast. One of the effective ways to get more listeners to a new podcast is to feature compelling and exciting. It is important to take quality interviews that will draw customer’s attention. And to do so, in-person interviews are better than the ones taken over the phone. Not only it helps in personalization but also makes the interviewee feel comfortable during the conversation. For instance, B2B marketers can take interviews of industry experts or company executives. Such podcasts are always trending in the industry as the listeners who hail from the B2B space are eagerly waiting to hear directly from the expert. Hence, try getting in touch with influencers who have more number of followers in the industry can help get genuine followers. Once you get started with your podcast, start tracking its performance. If it begins to attract active listeners and download increases, you must start looking for sponsors. Those who want to expand their audience reach and make profits can attract corporate sponsorships to fund their podcast. Furthermore, if your followers base increases, sponsors will come forward on their own to partner with your brand. Hence, the target should be to create podcasts that will give a quality return in the long-run. Do you have podcast ideas on your mind? Get a mic or a smartphone and get started with recording informative content now.